Composer and pianist, Guillermo Alonso Iriarte was born on 7th December 1973 in Cáceres (Spain, European Union), where he also lives nowadays. He studied piano with Ramón Coll, Josep Colom and Rosalyn Tureck. At 15 he received his professional honours degree. At the age of 17 he was awarded the highest tenth-course qualification from the Conservatorio Superior de Música de Salamanca (where he also obtained his Master's degree). Although Iriarte is a self-taught composer, outstanding personalities from the field, like Xavier Monsalvatge, Suzanne Ciani, Luis de Pablo or James DeMars have been advising him. He continued his studies in the Humanities with the philosopher and dancer Cristo Torres. He was awarded the First Infanta Cristina National Prize for Performance in 1988; the First Linares Marisa Montiel Prize in both categories (1987 and 1992); the Third Barcelona International María Canals Prize in 1989 (children's level); a unanimous Honourable Mention at the Kawai-Caja Postal Competition in 1989, and the General Certificate of Education Extraordinary Merit Award in 1990. At the age of 18 (July 1992) he won a permanent professorship on the staff of the state conservatories. He has performed in Madrid (Escuela Superior de Canto, Círculo de Bellas Artes), Barcelona (Casal del Metge, Academia Marshall, Aula Magna del Liceo), Oviedo (Auditorio Príncipe Felipe), Bilbao (Teatro Arriaga), Castellón (Auditorio), Lisbon (Teatro Saõ Luiz), Canberra (ISME Conference) and Salzburg (Mozarteum). Thanks to the support of pianist Guillermo González, EMEC released Iriarte's Nueve Estampas Naïves - In memoriam Michael Ende, whose stylistic principles have been endorsed both by Mariko Sato, Ende's widow, and Roman Hocke, the author's editor at Thienemanns Verlag and custodian of his literary legacy. 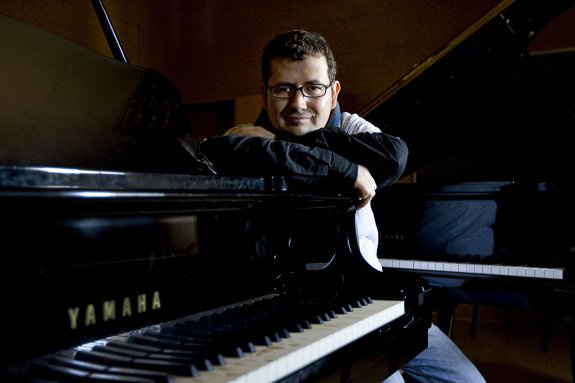 He recorded the piano part, composed by Pablo Cervantes, for the soundtrack of José Luis Garci's Tiovivo c. 1950, and Leandro Lorrio's compositions on the Canciones de la Tierra album. The record label COLUMNA MÚSICA issued in 2010 the CD Íntima intención. Obra para piano, focussed on his short solo music. His works have been world-premiered by pianists as gifted as Javier Perianes, Manuel Escalante or Mariana Gurkova. He also completed a concerto for piano and orchestra dedicated to the great Russian soloist Andrei Gavrilov, who had featured Iriarte's music in his recitals. Since the year 2000, he works guided by Maria João Pires, who premiered some of his pieces, and whose ethical and artistic excellence, together with her approach to life, are a decisive source of inspiration to him.